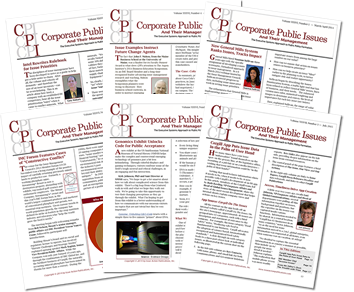 Issue Action Publications, Inc. is your best resource for focused Issue Management content. IAP offers newsletters, books and tools covering Issue Management best practices, trends, practical applications, case studies and more. Our mission is to advance the discipline of Issue Management by making knowledge and information readily available to Issue Management practitioners and professionals. Since coining the term “issue management” in 1976, CPI editors continue to probe for, create and share with our readers the most innovative and effective issue management tools available. Through CPI, you receive unduplicated, hands-on, practical guidance on how to advise your organization as its Issue Process Steward. This is a unique intelligence report that is practical yet provocative and geared toward your success. Issue Management: A Primer introduces the discipline of Issue Management and covers the key concepts, principal participants, issue life cycle, public interface, and operational requirements of a strategically relevant global Issue Management process. While the applications of Issue Management continue to evolve with shifting business goals and expectations, the foundations of the discipline endure as vital keys to achieve focused alignment, identification and execution. The front lines of corporate crisis management are hot and sweaty. The lessons learned are hard won, and the experiences are not for the faint of heart. This book will give you the inside perspective of a veteran practitioner who, throughout his career, developed creative ways for addressing the gut-wrenching challenges that come with leading the response to high-stakes crises. 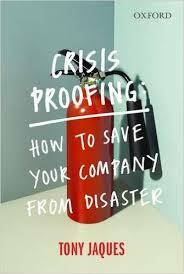 Crisis Proofing introduces readers to the concept of crisis proofing the corporation to help business executives and communication professionals recognize that a crisis is one of the greatest financial and reputational risks to an organization. It provides practical steps on what can be done to reduce the chances of a crisis and how to minimize the damage if a crisis should occur. Strategic Issues Management explores the strategic planning options that organizations can employ to address crucial public policy issues, engage in collaborative decision making, get the organization's "house" in order, engage in tough defense and smart offense, and monitor opinion changes that affect public policy. This book focuses on how enhanced reputation can contribute to commercial asset management. It also looks at how reputation loss can erode the ability of business to retain market share, maximize shareholder value, raise finance, manage debt and remain independent. While organizations often commit very costly resources to Crisis Management – planning and implementing what to do when a Crisis has struck – leading corporations are increasingly recognizing that many crises start as Issues. And they are turning to Issue Management as a cost-effective discipline for taking control of Issues and avoiding Crises. Our team of Issue Management Innovators, led by Teresa Yancey Crane, offers expertise in developing highly functioning and integrated issue management processes and tools that, for clients, are sources of competitive advantage. Learn more on our Services page.